:Water Doodle Bible is a unique activity book with a biblical message. Young children will enjoy painting with water as they reveal colorful art designs and learn fun stories from the Bible in English and Spanish. Children can then search for objects in the pictures as they practice simple words in both languages. Biblia de pintar con agua es un libro de actividades con un mensaje bíblico. Los niños se divertirán pintando con agua mientras revelan los coloridos diseños de arte y aprenden historias de la Biblia tanto en inglés como en español. Después podrán hacer una actividad de busca y encuentra con las imágenes mientras practican palabras simples en ambos idiomas. 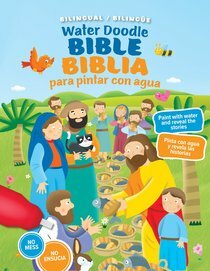 About "Water Doodle Bible / Biblia De Pintar Con Agua (Bilingual)"
Emanuela Carletti is a published illustrator. Her credits include My Bible Dot-to-Dot: In the Beginning and My Bible Dot-to-Dot: Noah's Ark. Emanuela was born in Milan, Italy. She still lives in Milan with her two wonderful daughters, a dog named Sally, and a cat. She loves anything to do with art, especially painting, and loves her job as a children's illustrator.